Mizuma Art Gallery is pleased to present MORI Junichi’s first solo exhibition “trinitite” starting from November 24, 2011. Mori was born in Nagasaki in 1965 and graduated with a MA in sculpture from Tokyo University of the Arts in 1996 where he presently works as an associate professor. He also continues creating on a daily basis. Past artworks include a series of marble and boxwood sculptures inspired by Leonardo Da Vinci’s water, foam and hair sketches. His fantastic carving skills give birth to a subtlety and a feeling of tension dwelling in the interstices between shadow and light, bringing his work both beauty and a kind of strangeness. Mori is a sculptor whose creations receive a wide attention every time they are shown to the public, such as during the “MOT Annual Exhibition 2010” group exhibition (the Museum of Contemporary Art Tokyo, Tokyo) or the Zipangu show held in 2011. The exhibition’s title “trinitite” comes from the artificial mineral generated by humanity’s first nuclear bomb test lead by America in 1945, the Trinity test. A weapon identical to the tested one was dropped on Nagasaki the same year. For the Nagasaki born artist, the atomic bomb will never be just one event among others in the course of history, but a reality impossible to look away from, always present like his own shadow, continuously wielding influence. Although Mori has already worked on the atomic bomb through past artworks, once again he decided to directly confront this topic for his first solo exhibition at Mizuma Art Gallery. On this occasion, he is revealing not only wood sculptures but also ceramics, photographs and drawings, each resulting in a different approach of the subject, in a particular experience. The artwork “trinity”, which may be considered as this exhibition’s central piece, is the artist’s biggest wood carved creation to this day. 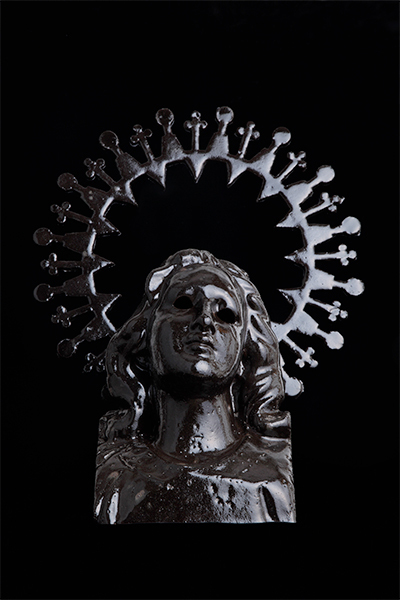 Mori created it after he got captivated by the cover a photography book showing a sculpture of the Trinity. The sculpture’s body, its interior, carved to the extreme, is surprisingly light compared to its dignified exterior appearance. The inside of the delicately chiseled head is a blend of light and shadow, giving the piece a new facial expression different from its model’s. This fierce yet frail figure bears the potential of a new icon. “shadow”, a black ceramic bust of the Virgin Mary is inspired by the Atomic bombed Maria of the Urakami Cathedral in Nagasaki. Both eyes have been scooped out to match with the original, presenting us with a darkness again different from the gleaming black ceramic. When you look into this darkness, in this dark emptiness, you can feel the weigh of the history plundered in a glimpse by the atomic bomb. Strangely enough, we find ourselves in the same emptiness, once again. We could say the fragility and dignity of Mori’s works indicate us the future path to follow. The artist says his own work is “trinitite” created following the Trinity nuclear test. We invite you to experience the present exhibition brought forth by Mori Junichi’s body and memories of being born and raised in a A-bombed city.